The Skin Taper? What is it? I recently had the pleasure of watching Colombo Roc aka Mr. North Park, complete the haircut featured here in this blog post. It's truly amazing to watch any skilled craftsman with their hands. Their tools become an extension of their thoughts, the manipulation of their tools becomes second nature. Like opening and closing your hand. It's really amazing. So what is a Skin Taper? Well it's similar to a skin fade except the sides of the haircut aren't faded any higher than the temple area. Also the back of the haircut is not faded higher than the occipital bone (or lower than 1/4th of the total area of the back of the head. Does it sound like math or science to you? Well it is, barbering is both artistic and scientific. 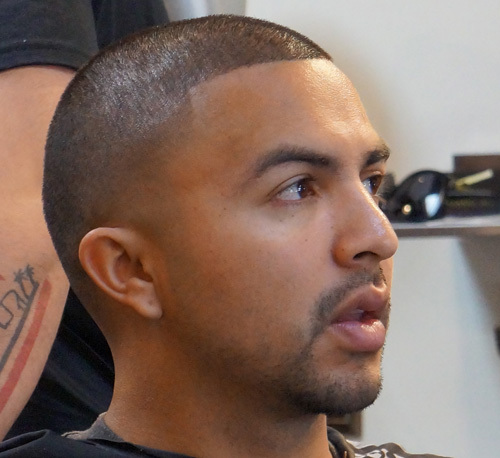 A barber uses his artistry and imagination to envision the haircut. Then he uses precise measurements on his clippers to achieve the look he earlier envisioned. Please excuse my use of the noun: He, I am in no way excluding female barbers. The best barber I know is a woman! I digress. A Skin taper can be any length all around, but the longer the hair the more difficult it is to get a great blend. If your barber is a rookie and your hair is long I wouldn't recommend this haircut for you at all. It's one of the easiest to mess up because there isn't a lot of margin for error. What's cool about the skin taper is that it also lasts a little bit longer than a normal taper since it's cut all the way to the skin. It still looks pretty clean a week or so later. 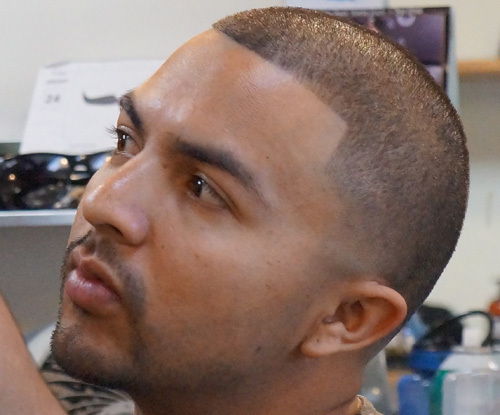 *note - a skin taper can be added to a shadow fade . You can tell your barber something like "let me get a low shadow fade, can you make it wave length on top, and can you taper the sides and the back out to the skin please? Doesn't that sound a lot cooler than "ummm take it low on the top but not to low , ummm shorten the sides up a bit, and ummm hook a brotha up." It's better to tell the barber exactly what you want, in terms that he/she understands. Remember skin tapers last long and look clean. Ask your barber if it would look good on you. And give it a try. If you need a fresh cut for 1/29/2014 only. Enter the word "skin taper" in the message box when you schedule your haircut and receive $5 off any service.